Naike Airfield: Private airfield 57 miles south of West Auckland at S37º 31' E174º 57.4', nine miles west of Huntly Town at Naike village. From unconfirmed Google Earth measurements the runway is 380m long aligned 19/35 at 250 ft altitude, with a 5% slope up to the SW, so all landings on 19 to the South and takeoffs on 35 to the North. Ngahinapouri (Reid's) Airfield: Private airfield 96 miles south of West Auckland at S37º 54.13' E175º 12.0', seven miles SW of Hamilton Airport. Unconfirmed Google Earth measurements show the runway as 350m long, with the runway aligned 06/24, at 120ft altitude. Airfield contact Stuart Reid, Ph 07 825 2919. 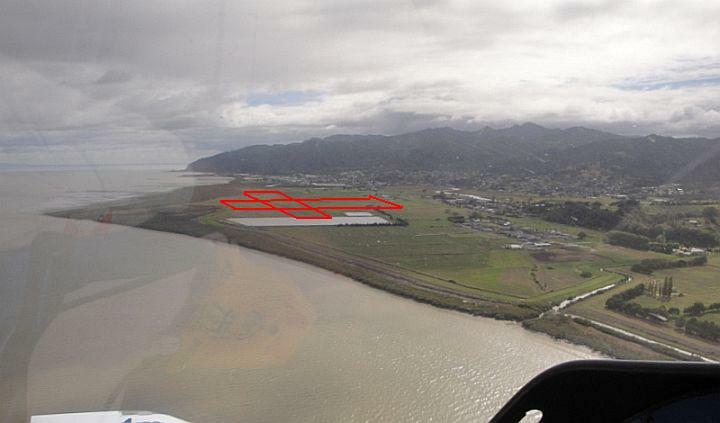 North Shore Airfield: AIP listed as NZNE. 11 miles east of West Auckland at S36º 39' E174º 39'. Fuel is available. 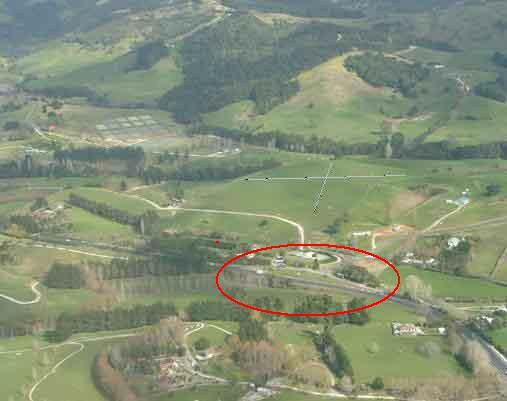 To find NZNE, identify the large white 'ski jump' building that runs down the hillside at Silverdale by the motorway, and the airfield is along the motorway one mile to the south by the road first over-bridge (Wilks Rd). This bridge is visible to the left of the photo below. North Shore weather station. Website: North Shore Aero Club. North Shore Airfield from the NW. Ohinewai Airfield: Private airfield 61 miles south of West Auckland at S37º 28.03 E175º 09.6, six miles north of Huntly Town. Unconfirmed Google Earth measurements show the runway as 430m long, with the runway aligned 05/23, at 30 ft altitude. Beware of power wires on approach. Ohinewai, just South of the timber mill. 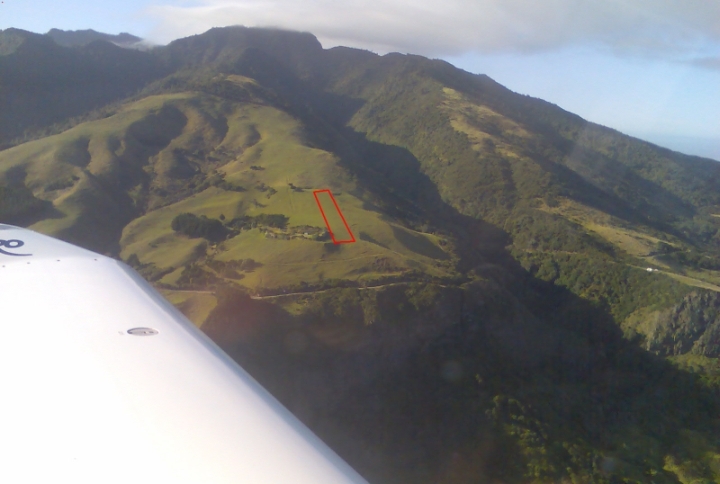 Okiwi Station Airfield, Great Barrier Island: AIP listed as NZOX. 57 miles NE of West Auckland at S36º 09' E175º 25'. Estuary swimming at high tide. Okiwi has a long and wide sealed runway. There are no facilities. Okiwi Station Airfield from the NW. 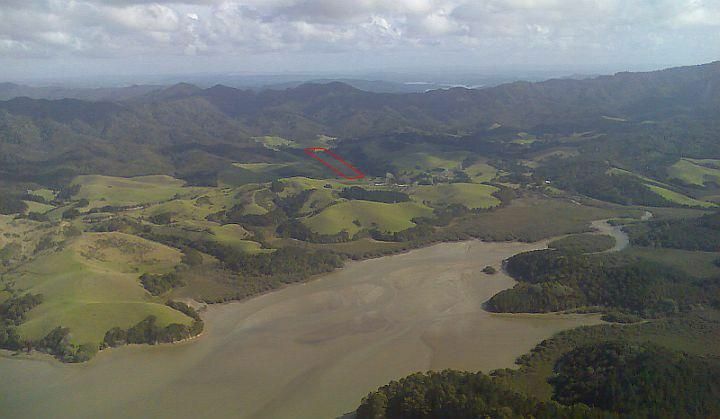 The airfield is on the river flats on the NE coast of Great Barrier Island and has been sealed since this photo was taken. Note the offshore 'Arid Island' for positioning. Omaha Airfield: Private airfield 24 miles NE of West Auckland at S36º 20.8' E174º 45.5'. The airfield is just south of the causeway to Omaha Beach, on the western shore of the harbour. Being at sea level, Omaha provides a good landing place for any aircraft caught out by low cloud on the East coast and unable to climb over the hills to West Auckland or North Shore. West Auckland provides a similar escape for aircraft caught under low cloud on the West coast. Because of trees to the West, landings are generally from the harbour towards the west, and takeoffs towards the east and out over the harbour. Avoid sudden movements and changes of power to avoid frightening horses. From unconfirmed Google Earth measurements the field appears to be 600m at 7ft altitude, with runway aligned 04/22. Contact owner, Dean Grice 021 123 1013. Omaha Airfield viewed from the East with the Omaha Beach, Whangateau Harbour and causeway. Click on photo for a close up view. Omamari Glider Strip: Private airstrip 60 miles NW of West Auckland, 10 miles NW of Dargaville and 1 mile east of the town of Omamari on the West Coast, at S35 51.88 E173 40.52. Unconfirmed Google earth measurements show the airstrip at 620m long, aligned 05/23, rising from 100ft at the western end to 240ft, a 7% slope making this a one way strip landing towards the east. Omamari village and airstrip from the east. Orini airstrip looking South. The strip is on the North side of the main road West from Orini town, beside the stop-banked stream. The buildings at the Western end have yellow rooves. Note the unusual double limestone race a little to the West, which is a good marker. 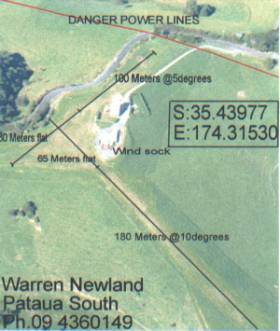 Paparoa 'Wings' Airfield: Private airfield 31 miles north of West Auckland at S36º 06.9' E174º 18.3'. To find it, follow the main road and railway west from Maungatoroto town, the white limestone airfield is alongside the road just before railway crosses the main road and heads north while the road continues west towards Paparoa. This is a one way strip, and from unconfirmed Google Earth measurements the strip appears to be 460m long aligned 11/29. All landings are towards the East on runway 11 which runs uphill from 150ft to 230ft altitude, a 5% slope. All takeoffs are downhill towards the West on 29. The strip performs like a 550m strip as the slope assists the braking when landing and acceleration when taking off. Contact owner, Murray Hargreaves, Ph 09 431 8325. 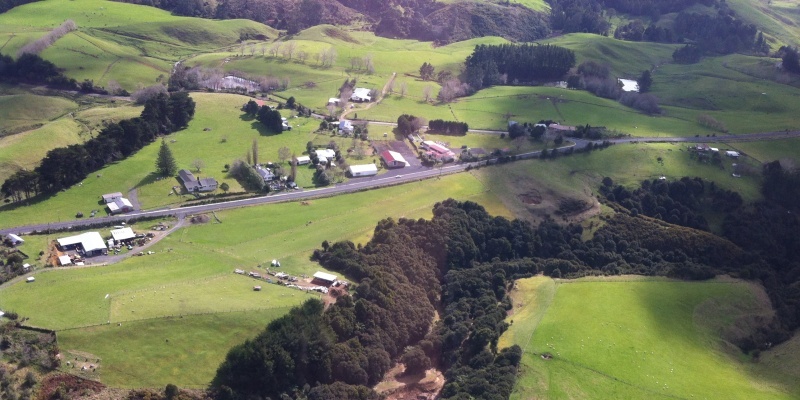 Paparoa 'Wings' airfield. 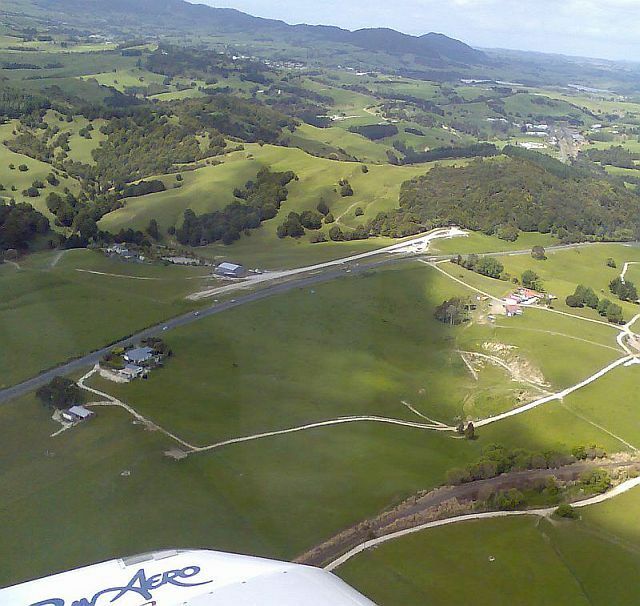 Murray Hargreaves' airstrip viewed from the SW, with Maungatoroto town and the Brynderwyn hills in the background. 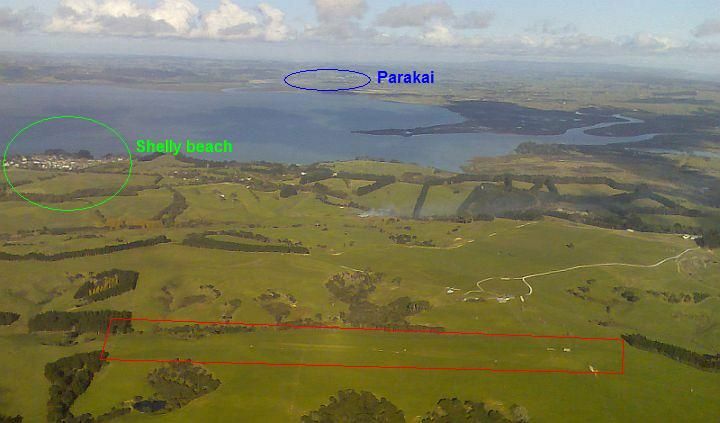 Parakai ... see 'West Auckland' below. Pataua South Airfield. Private airfield 57 miles to the north of West Auckland at S35º 44' E174º 31.5'. The longest of the runways is 245m with a flat touch down area, a steep 12% slope up the centre section, and a flat top. Being short, steep and variable slope, this strip should only be used by experienced pilots who understand their aircraft well, but with this limitation it is quite usable and feels like a much longer strip due to the steepness. From unconfirmed Google Earth measurements the main strip is aligned 01/19, all landings towards the North on 01 which runs uphill from 65ft to 200ft altitude. Takeoffs are on 19 towards the south. Contact Warren Newland ph 09 436 0149. Patumahoe Airstrip: Private airfield 40 miles south of West Auckland, half a mile SE of Patumahoe town and two miles NW of Pukekohe town at S37º 11.47' E174º 50.067'. Unconfirmed Google Earth measurement shows the strip as 500m long aligned 07/25 sloping up to the West from 220ft to 260ft altitude, a 3% slope. Local knowledge advises: caution power lines at E end; strip undulating with side slope in middle; SW turbulence from factory. Contact owner, Graham Weck Ph 09 2363833. 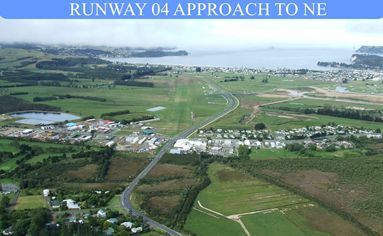 Pauanui Airfield: AIP listed as NZUN. 72 miles to the east of West Auckland at S37º 01' E175º 52'. Cafe and Swimming beaches. Generally firm even in winter with grass-on-sand runway. A popular lunch destination for aviators. 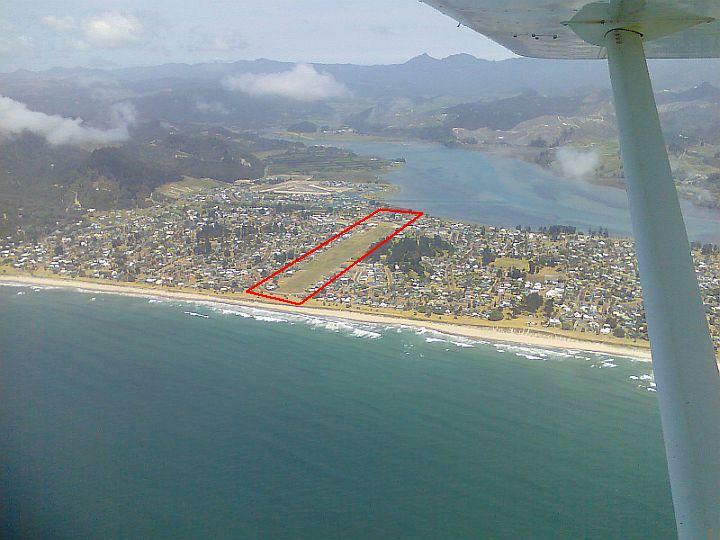 Website:Pauanui Airfield User group, Pauanui Beach info. 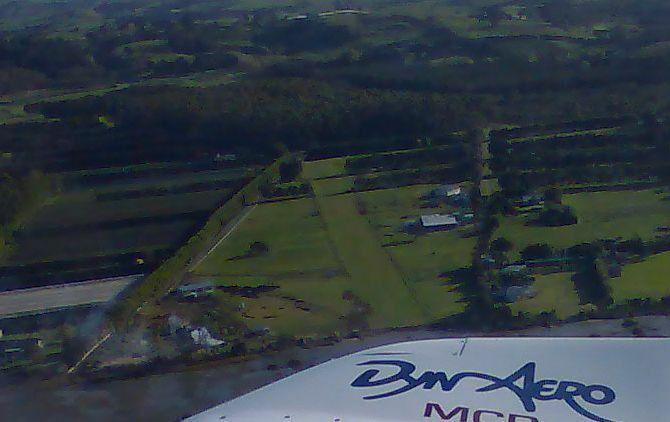 Pauanui Airfield from the East. Pinaki Airstrip: Private airstrip 38 miles NW of West Auckland, four miles WSW of Ruawai Town, on the Pouto Peninsula which forms the north heads of the Kaipara Harbour, at S36 09.44 E173 57.15. Used as an emergency landing strip by gliders. Unconfirmed Google Earth measurement shows the strip as 480m long aligned 10/28 at 430ft altitude and sloping up to the south. Portland Airfield: Private airfield 55 miles north of West Auckland, four miles west of Whangarei Airport and two miles west of Portland Cement Works, at S35 47 17 E174 17 09. From unconfirmed Google Earth measurements, the strip appears to be 300m long and aligned 11/29, sloping up from 130ft altitude at the western end to 260ft at the east, a 10% slope so it would be a one-way strip with all landings on 11 and all takeoffs on 29. Contact Brian Taylor, Ph 09 432 9542 or Mob 021 031 8394. Portland Airstrip from the west, showing the position relative to local features. To find it, follow the Main Rd to find where the easily recognised road branches to the East to the Cement works, then fly to the West up the Otakia Valley. Puhipuhi Glider Airfield from the North. Hikurangi Town (circled in green) is lined up with Kamo and Whangarei City. Pukekoke East Airfield, looking East from near Pukekohe Town, look for the large crater with the airfield running up the Western rim. 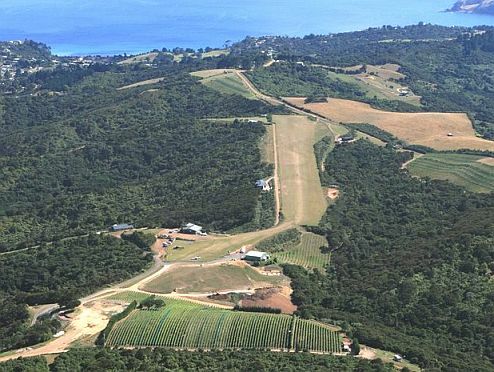 Raglan airfield viewed from the west, with the harbour entrance off the end of the wing in this photo. 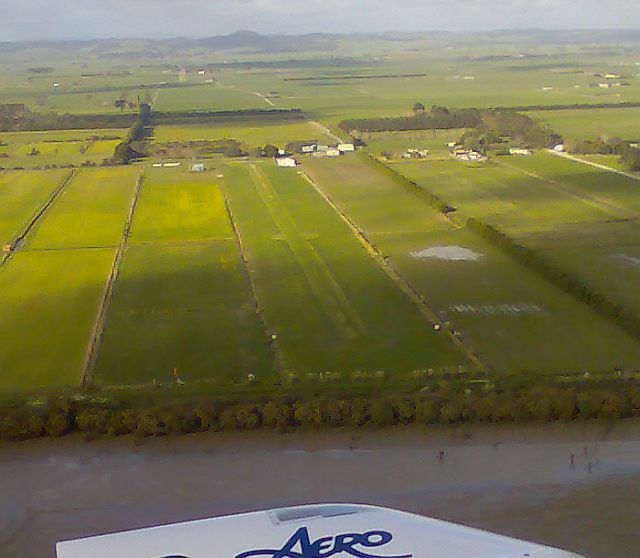 Ruawai airfield from the west, over the Wairoa River. Note that the paddock which has the windsock by the river bank is NOT the airfield. 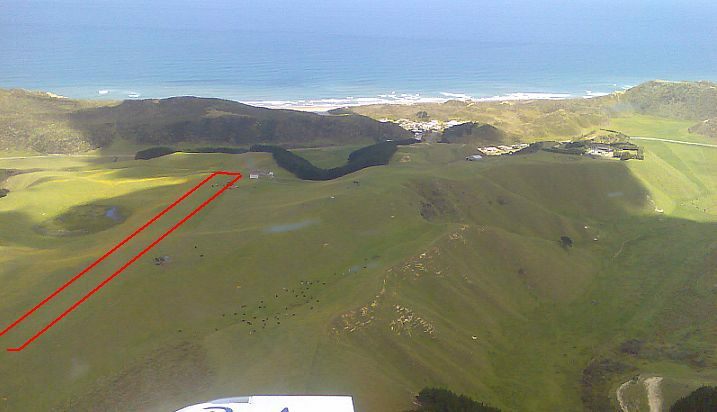 Sandhills Glider Strip: Private airstrip 109 miles NNW of West Auckland, near Ninety Mile Beach, four miles NW of Kaitaia Town at S35 04.76 E173 11.46. Used as an emergency landing strip by gliders. Unconfirmed Google Earth measurement shows the strip as 500m long aligned 02/20 at 70ft altitude. Sandhills Rd Airfield. Close to Ninety Mile Beach near a cluster of small lakes. 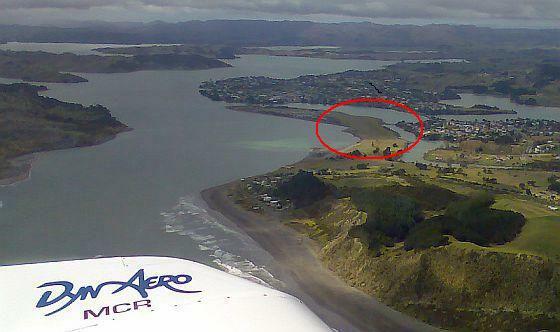 Kaitaia town is abeam when flying along the beach close to this airstrip. Schick Glider Strip: Private airstrip 35 miles NW of West Auckland, three miles SW of Ruawai Town on the Pouto Peninsula, at S36 11.04 E173 59.10. Used as an emergency landing strip by gliders. Unconfirmed Google Earth measurement shows the strip as 300m long aligned 10/28 at 330ft altitude. Schnackenberg Rd (Aotea Harbour) Glider Strip: Private airstrip 81 miles South of West Auckland, 10 miles SSW of Raglan Airfield at S37 57.35 E174 47.336. This strip is on the clifftop right at the southern end of the long beach between Mt Karioi and Aotea Harbour, usefully placed if caught by low cloud and unable to get past Mt Karioi (Woody Head) north to Raglan airfield, or past Albatross Pt south to Taharoa airfield. Used as an emergency landing strip by gliders. Unconfirmed Google Earth measurement shows the strip as 490m long at 260ft aligned 04/22 with a 5% slope up overall (perspective has distorted the photo below, from this approach path the blue part slopes up fairly steeply then it flattens off for the red part)... so landings would be on 04 except in a strong westerly wind. Schnackenberg Rd Glider Strip, looking east from the bluff at the south end of the long beach that runs south of Mt Karioi (Woody Head) at Raglan. Aotea Harbour is in the background. Shakespeare Bay Airstrip: Private topdressing airstrip 20 miles to the east of West Auckland at S36.610º E174.828º, right at the eastern end of Whangaparaoa Peninsula. A useful strip to be aware of for emergency use in the Gulf. From unconfirmed Google Earth measurements the strip appears to be 360m long aligned 18/36 sloping up from 190ft at the south to 250ft at the north end, a 5% slope up to the north. 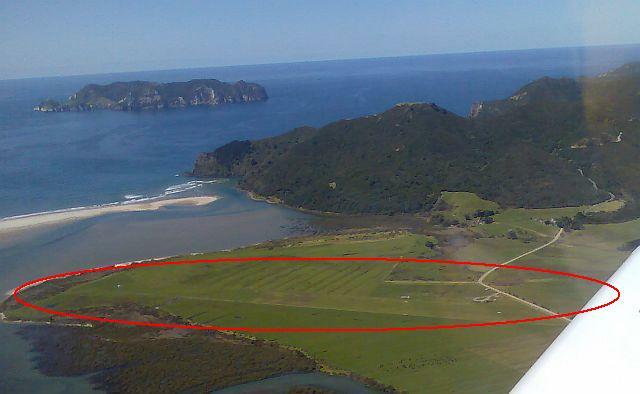 Shakespeare Bay Topdressing Airstrip from the West, Tiri Island behind. Shelly Beach Airstrip: Private topdressing airstrip seven miles NW of West Auckland, one mile beyond Shelly Beach town, at S36º 33.88' E174º 20.97'. 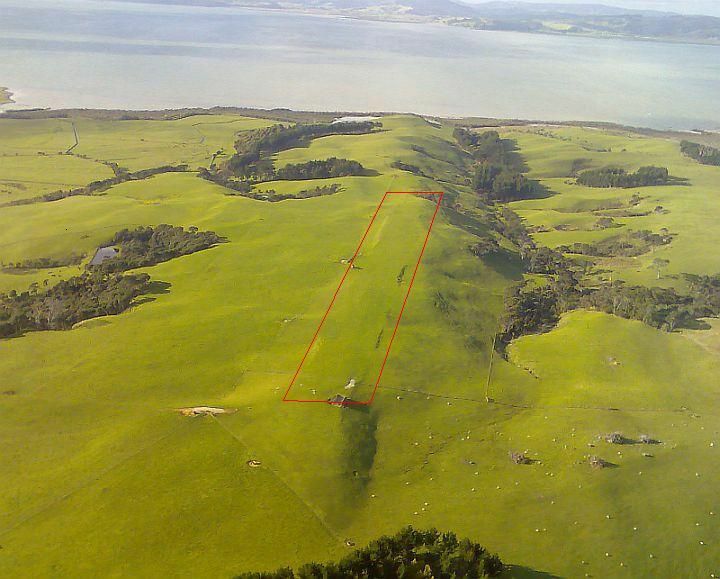 Topdressing strips are not normally listed here, but this one is in an area often used by training aircraft from West Auckland and being long and wide could provide a useful escape route in event that an emergency landing was necessary. From unconfirmed Google Earth measurements the strip is 650m long, aligned 04/22, rising from 130ft altitude at the eastern end to 200ft at the lime bin at the West, a 3% slope that would favour a landing towards the West except in a strong Easterly wind. 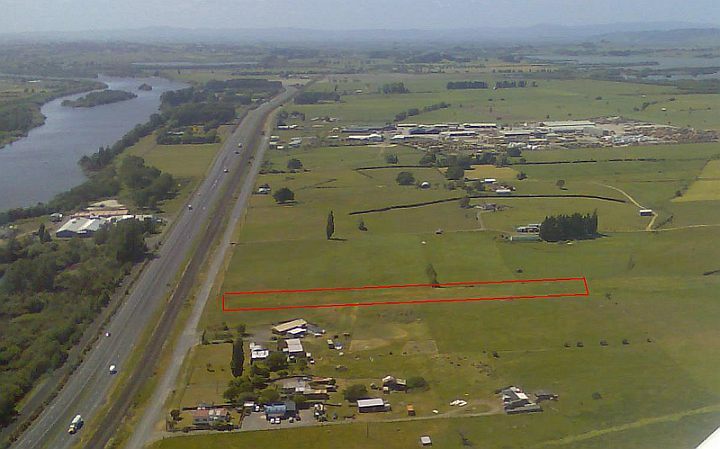 Silverdale Airfield: Private airfield 11 miles east of West Auckland at S36º 36.9' E174º 38.9'. One mile NW of the Silverdale motorway interchange. The runway is 575m long aligned 04/22, at 60ft altitude at the eastern end rising to 120ft at the western end, a 3% slope, all circuits to the north. When using runway 22, approach at an angle from the North for easier clearance of the trees on approach. Contact Paul Hopper Ph 021 621627 or 09 426 9299. Slipper Island Airfield from the North. 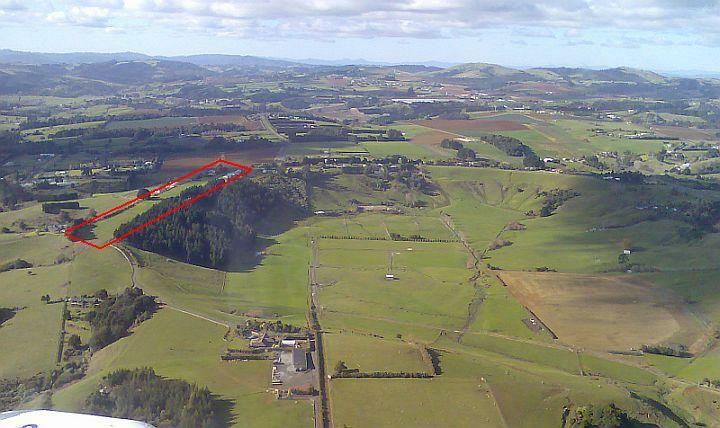 Springhill Airfield: AIP listed as NZSL. 21 miles NE of West Auckland at S36º 19' E174º 33'. 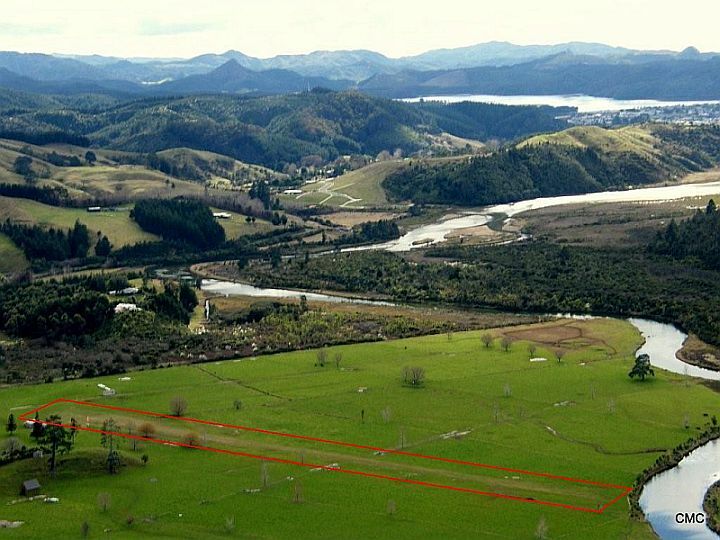 To find the airfield line up the square pond with Wellsford town, the airfield being near the hills where the main road goes into the Dome Valley near the two Hoteo river bridges. Springhill airfield viewed from the SE, with Wellsford town and large square pond in the background. 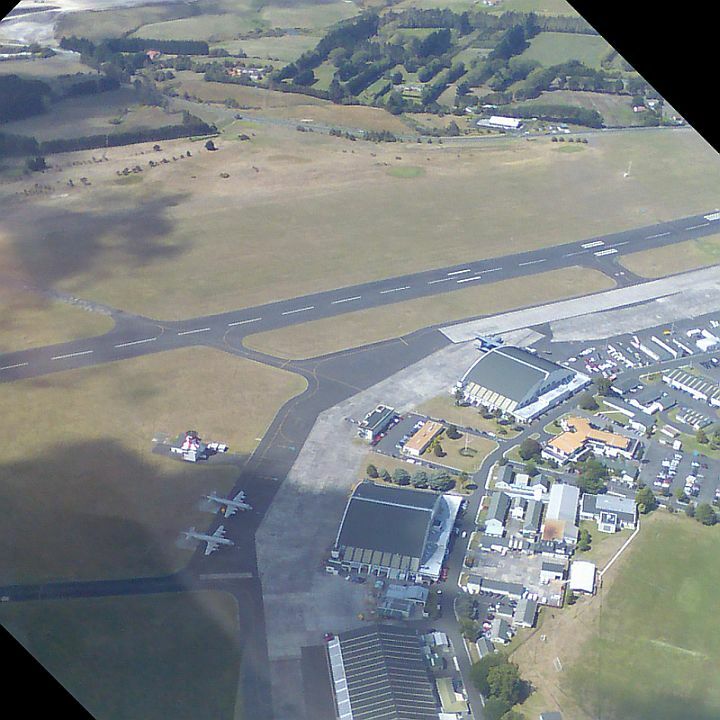 Te Awamutu Airfield: (Castleton's airstrip). 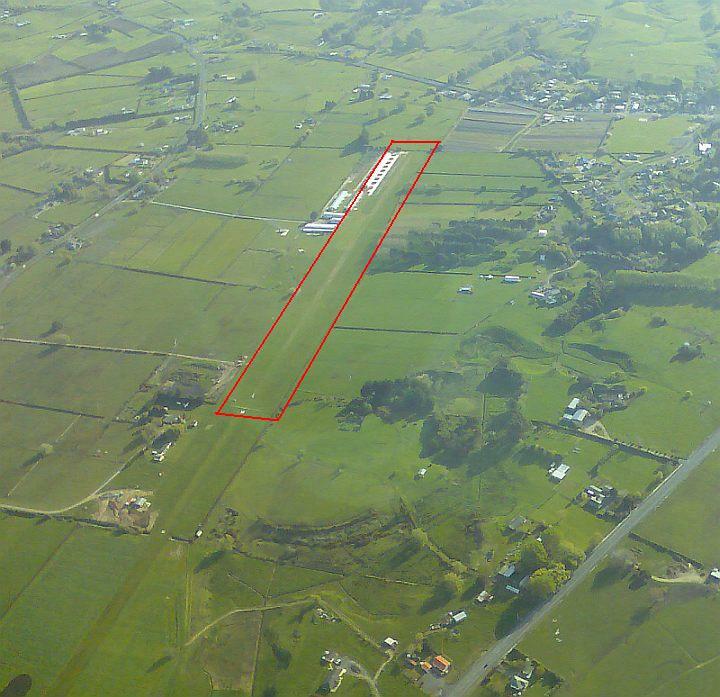 Private airfield 93 miles south of West Auckland at S38.021 E175.339, just north of the golf course that lies between between Te Awamutu and Kihi kihi towns. From unconfirmed Google Earth measurements the runway appears to be 615m long, aligned 05/23 at 180ft altitude. Contact: Ken Castleton, Ph 07 871 5572. 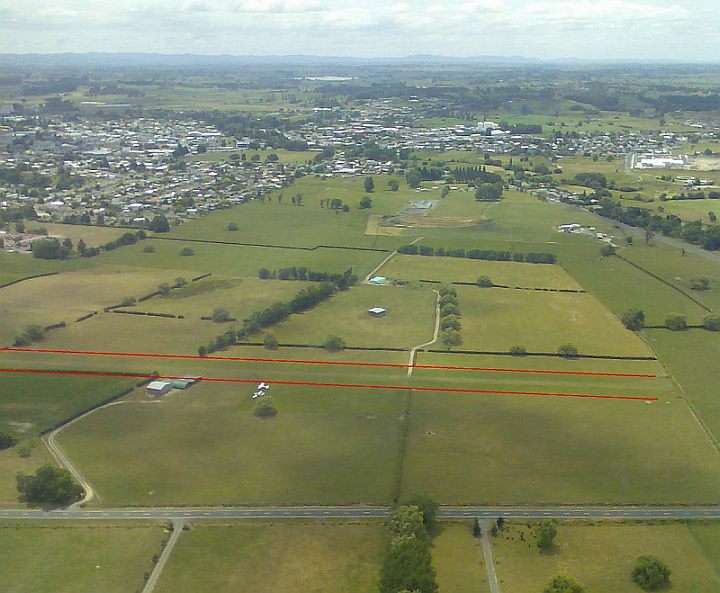 Te Awamutu airfield looking North from an aircraft overhead the Golf Course. Te Kowhai Airfield: AIP listed as NZTE. 75 miles south of West Auckland at S37º 45' E175º 09'. Avgas available. 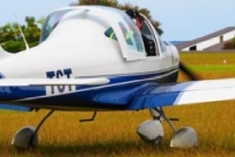 Te Kowhai has excellent facilities and is a welcoming airfield for recreational flyers. Te Kowhai Airfield from the NE. Since this photo was taken the available runway has been extended to the east. Te Mata Glider Strip: Private airstrip 76 miles south of West Auckland, five miles south of Raglan Airfield at S37 53.39 E174 52.855. Used as an emergency landing strip by gliders. Unconfirmed Google Earth measurement shows the strip as 450m long at 500ft aligned 08/26 with a 7% slope up to the East, so all landings would be on 08. Temple View Airfield (Ford's Airfield): Private airfield 79 miles SE of West Auckland, at S37º 48.87' E175º 15.1', one mile north of Collins Rd Airfield. Unconfirmed Google Earth measurements show the airfield as 640m long, aligned 08/26 at 130ft altitude. Owner Wayne Ford. Over the river on left base and turning final for runway 32. (click on photo for the view when descending non-traffic side for 32). Thames town in the background. 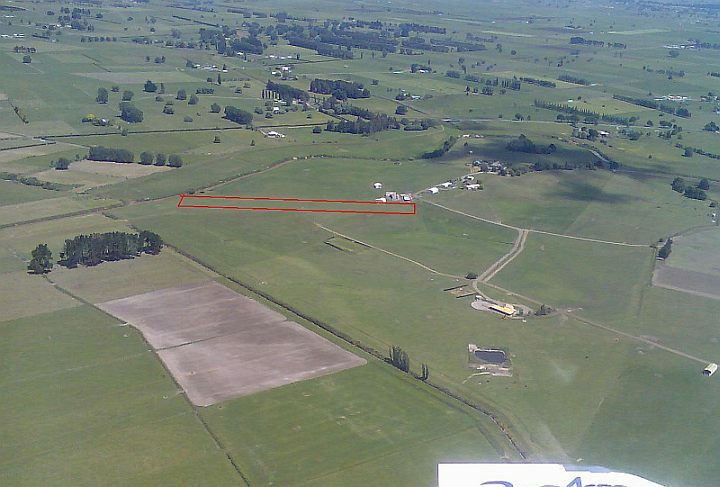 Tinopai Area Airfield: Private airfield 30 miles north of West Auckland at S36º 12' E174º 10'. The strip is a straight section of sealed farm road with runway markers 01/19. From unconfirmed Google Earth measurements, the 01 end appears to be at 460ft and the 19 end at 495ft, a 3% slope, 450m long. Flying up the harbour from Tinopai, the airfield is just past two small islands offshore. Contacts and owner unknown. 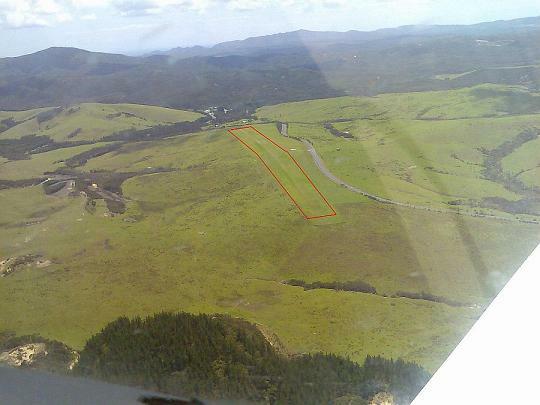 Mystery airstrip 5 miles NW of Tinopai on the eastern shore of the Kaipara Harbour. Viewed here from the SE. van Houtte Rd Glider Strip: Private airstrip 73 miles South of West Auckland, four miles SE of Raglan Airfield at S37 50.341 E174 57.0. Used as an emergency landing strip by gliders. Unconfirmed Google Earth measurement shows the strip as 450m long at 200ft aligned 01/19 with a 7% slope up to the South, so all landings would be on 19. Waiau Pa Airfield: Private airfield 33 miles south of West Auckland, one mile SE of Waiau Pa town and three miles ESE of Clarks Beach town at S37º 08.52' E174º 46.4' Runway 18 / 27, 600m at 75ft altitude. Contact Tony Antonievich Ph 09 232 0228. 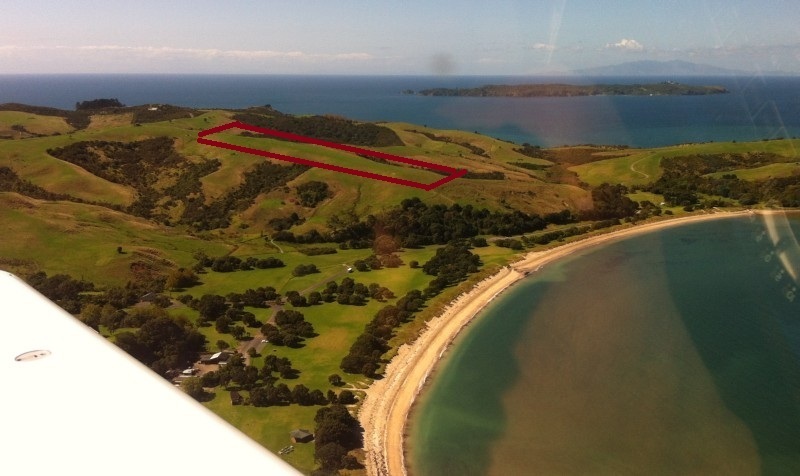 Waiheke Airfield: AIP listed as NZKE. 33 miles east of West Auckland at S36º 48' E175º 05'. - Peacock Sky Vineyard http://www.peacocksky.co.nz/ has a high quality restaurant that is normally open for lunch, and is 50m off the Northern end of the strip, hop the fence. -The Batch http://www.batchwinery.com/ about 100m from the apron. - EcoZip is also right by the Northern end, http://www.ecozipadventures.co.nz/ with flying fox and adventure type activities, hop the fence. - Waiheke taxis Ph 09 372 8038 will pick up flyers at moderate cost and take them to Oneroa or Onetangi, which have cafes and good beaches. 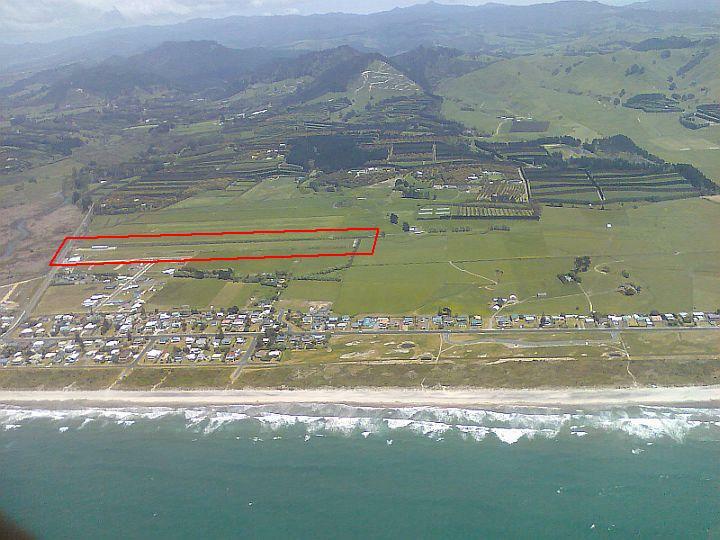 Waihi Beach Airfield from the East. 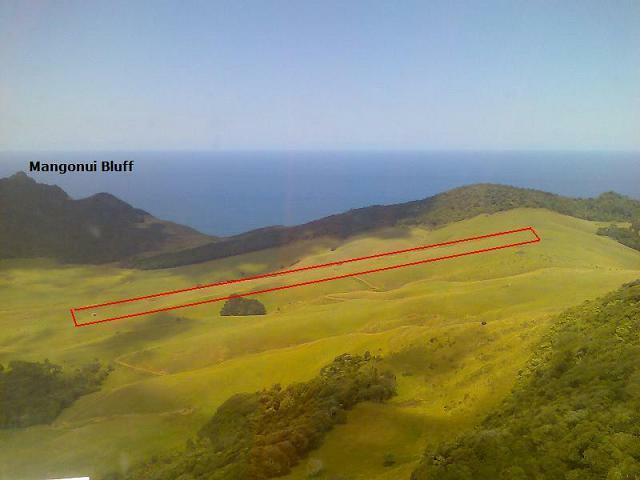 Waitapu Rd Glider Strip: Private airstrip 70 miles NW of West Auckland, located on the back slope of the northernmost of the two hills of Manganui Bluff on the West Coast, 20 miles north of Dargaville, at S35 44.72 E173 33.61. Used as an emergency landing strip by gliders. Unconfirmed Google Earth measurement shows the strip as 520m long aligned 10/28 with a steep 13% slope up to the NW. This strip is easy to find, but would not be usable in strong westerly winds due to the rotor turbulence on approach, being in the lee of the sharp edged Mangonui Bluffs. Waitapu Rd Glider Strip, on the back slope of the nortnernmost hill of Mangonui Bluff, slopes up steeply to the north. Waitiki Landing Airfield, Parengarenga Harbour: Private airfield 148 miles north of West Auckland at S34 31.6 E172 50.3 10 miles SE of Cape Reinga, Waitiki Landing is the most northerly known airfield in NZ. 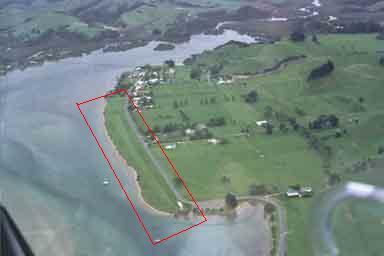 It is leased by Salt Air, Ph 09 402 8338, email info@saltair.co.nz, who use 133.10 as the working frequency at Waitiki. 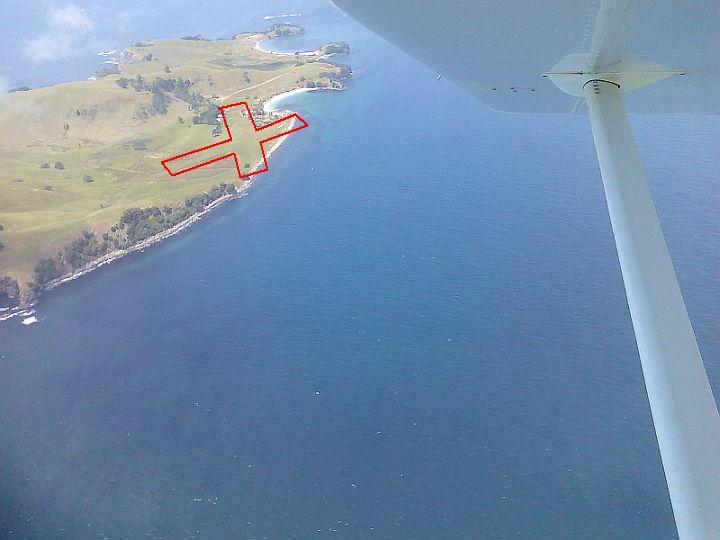 To find the field, fly due west from the Parengarenga Harbour entrance until you meet the main road north. The airfield runs along the western side of the road. Unconfirmed Google Earth measurements show it as 730m long aligned 17/35, with landings normally towards the north on runway 35 rising from 150ft to 200ft, a 2% slope, and takeoffs on 17 to the south. Waitiki Landing Airfield looking north. Warkworth South Airstrip: Private airstrip 17 miles NE of West Auckland at S36º 25.5' E174º 38.5' Knowledgeable aviators advise to "Use with caution as it is a hillside paddock" which is supported by unconfirmed Google Earth measurements that show the field at 250ft altitude sloping up to the NW with landing vectors between 150m and 240m long. Contact Grant Corlett. Ph 09 425 8463. 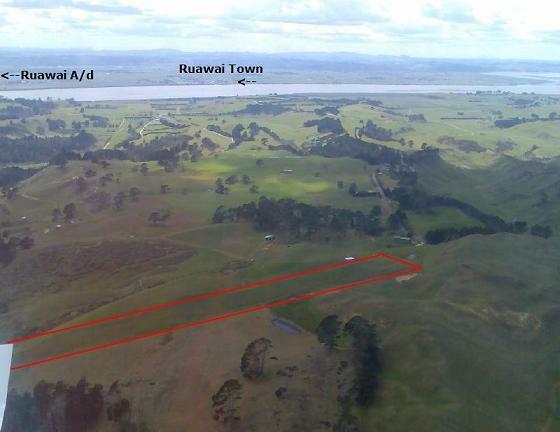 Warkworth South airstrip, from the NE [Brian Millett photo]. 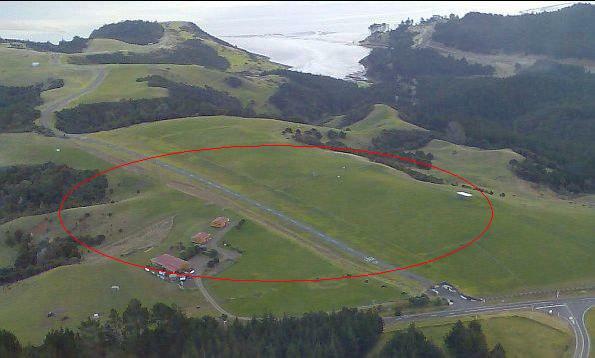 To find the airstrip, look for the loop off the main road at the vineyard (circled above) and the airfield is on the hillside immediately to the SW.
West Auckland Airport (Parakai): AIP listed as 'Parakai' and NZPI with calls to 'Parakai Traffic' on 123.5mhz. At S36º 39' E174º 26' . Avgas payable by cash/eftpos/credit card/internet banking. No oil co swipe cards. Courtesy car (8 seat people mover) available for visiting aviators to get to local cafes at Helensville, and the Thermal pools at Parakai or into Auckland City (35 mts). Landing fees automatically billed. Websites: Parakai/Helensville area info, Parakai Springs Hot Pools, West Auckland Airport Home Page, West Auckland weather station. West Auckland Airport from the SW, non-traffic side. Click on photo to enlarge, or click here for Operational details . Whaanga Rd (Mt Karioi, Raglan) Glider Strip: Private airstrip 73 miles South of West Auckland, four miles SW of Raglan Airfield, on the NW flank of Mt Karioi at S37 50.482 E174 46.705. Used as an emergency landing strip by gliders. Unconfirmed Google Earth measurement shows the strip as 500m long at 800ft aligned 11/29 with a steep slope up to the SE, so all landings would be on 11. Whaanga Rd Glider Strip from the North. Only for the brave or desperate, Whaanga Rd runs steeply up the north face of Mt Karioi (Woody Head) at Raglan. Whangamata Airfield 11/29 from the South, Whangamata town and estuary at the top right. [Cliff McChesney photo]. Operations notes: To satisfy private property / home owner's rights, height clearances need to be observed. Please observe the ops notice below when arriving or departing. NZWR from the NE. Limestone island at the top left. WFC hangar #10 and clubrooms circled. Whangaruru Airstrip: Private airstrip 79 nm north of West Auckland at S35º 20' E174º 17', at the top of the Whangaruru Harbour, three miles NW of Bland Bay. Find it by flying up the Whangaruru Harbour to the mangroves at the end, at which point the airfield will be seen in the valley to the West. From the air it appears to be a sloping strip but is almost flat and usable in both directions. Unconfirmed Google Earth measurements show it at 50ft altitude, 600m long and aligned 06/24. Whangaruru Airstrip near the head of the Whangaruru harbour, looking north. Opua Inlet in the Bay of Islands is visible in the distance over the ridge. Whenuapai Airbase: AIP listed as NZWP. 13 miles SE of West Auckland at S36º 46' E174º 38'. Private aircraft can land at Whenuapai only with permission of the base commander. But like Auckland International Airport, Whenuapai is worth remembering in event of an in-flight emergency, with its long and wide runways and good support services. 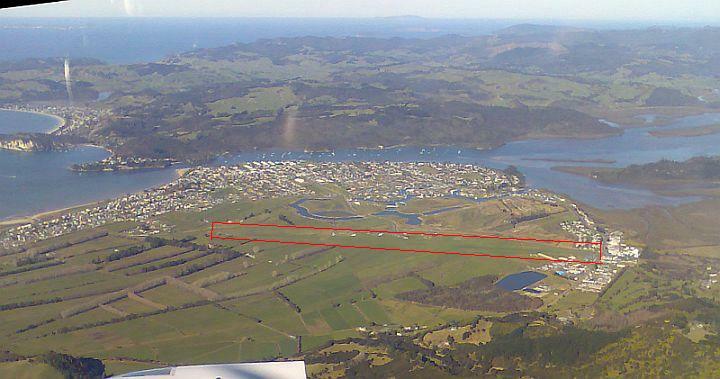 Whitianga Airfield and town from the North. Click on the photo for a MBAC photo of the approach on 04. Wilsons Rd, Kaipara South Head, Airstrip: Private airstrip eight miles NW of West Auckland, four miles west of Shelly Beach town, on the Kaipara South Head Peninsula, at S36 35.215 E174 17.337. Used as an emergency landing strip by gliders. Wilsons Rd strip from the north. Shelly Beach town on the harbour edge to the left and West Auckland in the distance to the right. 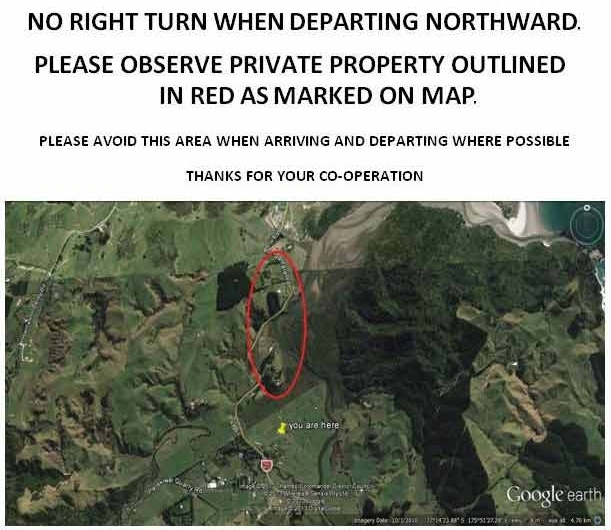 Please advise harvey@ParakaiAirfield.co.nz any corrections or known airfields/airstrips within 100 nautical miles of West Auckland that have been missed. 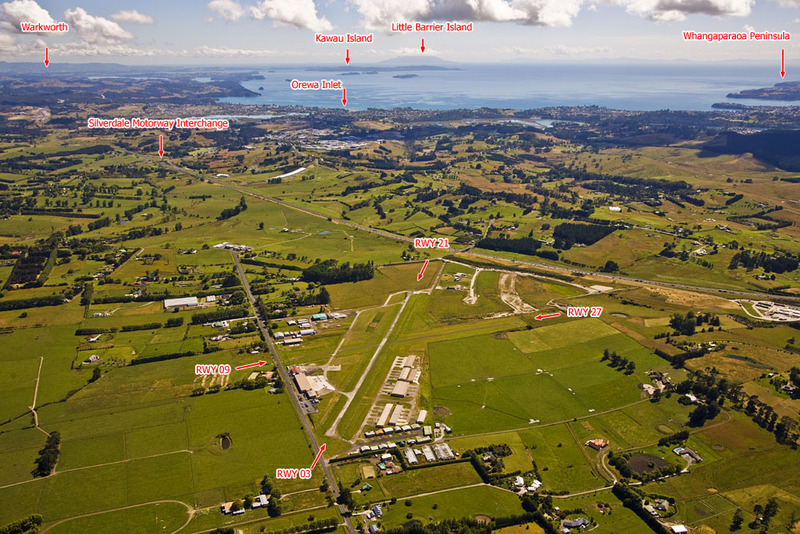 Link to CAA Airfield co-ordinates and Official Maps of 139 x NZ Airfields , which shows all the AIP airfields and some private fields. North Island survey map of all known strips... this is a 2 meg .pdf file so needs broadband to load quickly. It can be zoomed in with the +/- buttons displayed. Small jpeg file of Lower Northland strips from the survey map.